Chinese geese are known for their friendly dispositions, thorough weeding skills and alert behavior. Available in varieties of white, brown and gray, males and females both grow singular large knobs at the bases of their beaks. The knob usually grows larger in males. Besides that identifying aspect, other means of identifying male Chinese geese from females. 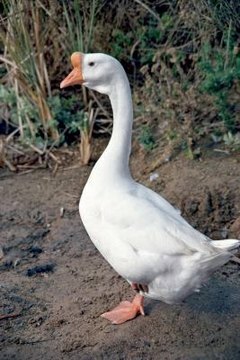 Male Chinese geese usually stand more upright than females of the species, holding their head upright with the beak pointed upward. Females have more horizontal stances, keeping their heads level or pointed slightly downward at the end of gracefully arched necks. Females will find quiet areas during the day to lay eggs during spring and early summer. Males are usually larger than females, weighing up to 12 pounds when they are fully mature. Females weigh up to 10 pounds. Males tend to be noisy, with high-pitched vocalizations. Females make a low-pitched "oink" sound that is much quieter. Females also have larger openings below their tails, at least after they've laid their first eggs.